Dealing with Flash Mob Theft, Part 1: Steps to Protect Your Retail Business | Douglas Montgomery, Jr.
Shoplifters frequently use distraction and diversion techniques when carrying out their crimes. But recently, the practice of “overwhelming” has been added to the mix. I’m referring to the recent spate of “flash mob” thefts, where large groups of people descend upon a store and steal multiple items in rapid fashion. Store associates are so overwhelmed with the number of people and level of activity that it’s impossible for them to stop the theft. Many of these incidents involved culprits targeting high-end items like iPhones and designer handbags. In one recent incident in Boston, a gang stole $14,000 in electronics, all in a matter of seconds. This YouTube clip shared by several news outlets shows one group that targeted a number of stores in the San Francisco Bay area. Because these crimes happen quickly, and the value of goods stolen is high, many retailers are struggling with how to protect themselves. In this two-part series, we’ll explore measures that can help discourage flash mob theft in your retail locations, as well as some security tools that can be extremely helpful if your business has been the victim of this type of crime. Let’s start with the preventative aspect; below are some steps you can take to discourage flash mob robbers from visiting your store. The goal of a flash robbery is to steal as much as possible in a few minutes or less. To combat this, you have to make it difficult for thieves to grab multiple items. For example, if you’re a clothing retailer, consider alternating hangers on your racks, so some are facing in and others are facing out. This can limit the amount of clothing stolen during a flash mob robbery. Similarly, stack clothing in small layers, and put some on shelves that are harder to reach. If possible, lock up big-ticket items like electronics and perfume. If you’re a C-Store owner, limit the amount of food and drink items on display, and keep stock out of reach or in a back room. Every retailer has policies on shoplifting. Unfortunately, if your organization has a non-pursuit policy – instructing employees not to try to stop theft – and this policy becomes public, it can encourage thieves. I’ve seen this happen to retailers and the losses can be staggering. Shoplifters will brazenly steal in plain sight of employees because they know they won’t be stopped. I recommend keeping a tight lid on non-pursuit policies, and posting signs that declare your intention to prosecute all shoplifters to the fullest extent of the law. In my years in retail loss prevention, I’ve seen how beneficial video surveillance can be when it comes to deterring shoplifters. 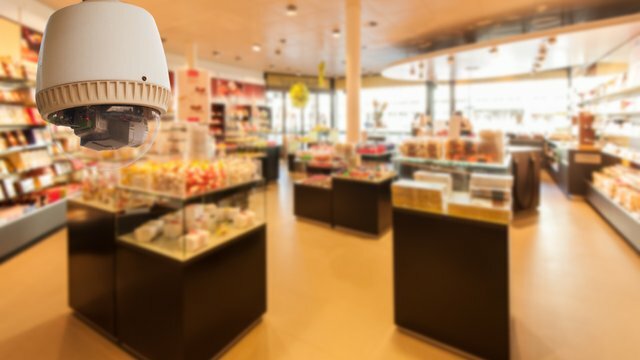 The presence of cameras, as well as posted signs reminding shoppers that surveillance is in place, can discourage not only shoplifting, but vandalism, internal theft and other crimes as well. Without a security system, you have little recourse in the event of a flash mob theft. A store in Florida recently found this out the hard way when a flash mob stole $18,000 worth of designer purses. The store didn’t have a video surveillance system in place, so it had no images to provide to police. I recommend using IP cameras with at least 4 megapixel resolution, as these can give you very detailed images of suspects. Remember to also choose a reliable recording solution, like a high-quality network video recorder (NVR) or recording server that protects your data and has the capacity to store video for whatever amount of time your retail organization requires (30 days or more, for example). Talk to other retailers about what they’re experiencing and join a retail association if one exists in your community. Most shopping centers have mall associations, and many urban areas have an anti-organized retail crime group that shares information on recent thefts, including suspect images. If you’re aware that an organized crime or flash robbery group has been operating in your area, you’ll know about their tactics and what to look out for. All of the above are pro-active steps you can take to discourage theft and better protect your retail assets. In Part 2 of this blog, we’ll explore the security tools available to help you investigate flash mob-style robberies.